Summary: If you are facing problems with Canon XF305/XF105/XF100/XF300/C300/C500 MXF when importing to Final Cut Express, you can follow this article to find the solution and solve it. Canon MXF high-end camcorders, Canon C300, C500 and XF series, like XF305, XF100, XF105, XF300, are more and more popular for photographer, cameraman and other people thanks to its high quality videos. These excellent camcorders record high-definition video footages in .mxf format. It’s good to maintain the high quality of the video by using MXF format, but this format is not compatible with editing software and other portable devices. For example, you may encounter many problems when you want to import MXF to Final Cut Express on Mac. To get those MXF files work normally in FCE without rendering time, the best solution here is to encode MXF to something that FCE can read easily. After googling, we will get that Apple InterMediate Codec is the one that can be supported by FCE. So you will need a professional MXF Converter for Mac to help you to convert Canon MXF files to AIC MOV for FCE . 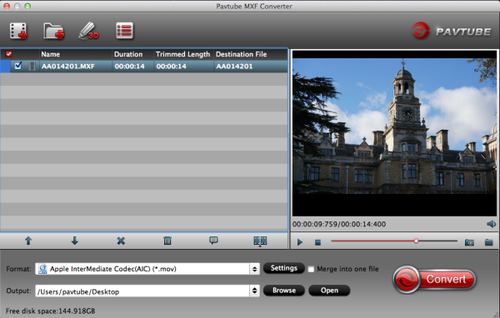 Here Pavtube MXF Converter for Mac is highly recommended as it is an easy-to-use and intuitive Mac tool for camcorder users. It is good at converting MXF recordings shot by Panasonic P2, Canon XF series and Sony XDCAM camcorders to formats compatible with your video editing software like Final Cut Express, iMovie, Final Cut Pro (X), Avid Media Composer, Adobe Premiere, and more. Below is a brief guide for you. Step 1: Import Canon MXF files to the top MXF to AIC Converter. Launch the MXF to FCE Converter. Click the button “File” to add Canon MXF files to it or directly drag and drop the files your MXF files. If it is necessary, you can double click the each file to have a preview. Tips: If you have multiple Canon MXF files, you can select the “Merge into one” box to merge the files into one single file for FCE so that you can play these files without interruption. Step 2: Select an output format for FCE and set the output folder. Click on the “Format” and you will get a dropdown menu. 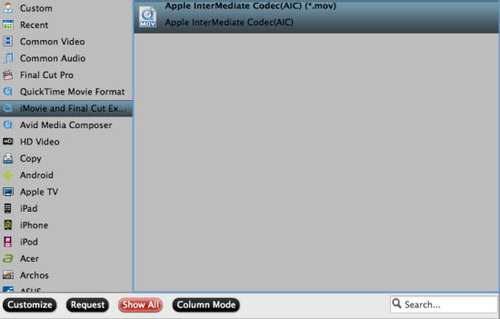 Move you pointer to iMovie and Final Cut Express > Apple Intermediate Codec(AIC) (*.mov). It is the compatible format for FCE. Then you can set the output folder by clicking “Browse” icon as you need. Note 1: You’d better set the video frame rate as 30fps, video size as 1920*1080 to keep the best quality for editing in FCE. If you want to have a smaller file size but keep the good quality, you can change the video size to 1440*1080. Note 2: You can customize the defaults and save them as custom conversion settings without affecting the original default selection. Step 4: Start to convert Canon MXF files to AIC for Final Cut Express. Click the “Convert” button, it will convert Canon MXF files to AIC for FCE on Mac immediately. You can find the process in the “Conversion” interface. When the MXF to AIC conversion process is 100% completed, you will be able to get the output files for FCE by clicking on “import” button effortlessly. Now you can easily import Canon MXF files to FCE for editing with high quality without any trouble. How to import the converted files into FCE to do post-production?